NASA/ESA Hubble Space Telescope images of the three galaxies studied by a team of astronomers who try to understand how galaxies formed when the Universe was half its current age (upper panels). The same galaxies were then studied with the FLAMES/GIRAFFE instrument on ESO’s Very Large Telescope (VLT) to probe the motions of gas in these objects (lower panels). Parts which are red are moving away from us, while those that are blue are moving towards us. Distant galaxies once represented mere specks of light inthe sky. But astronomers are now using Hubble and Europe's Very Large Telescope(VLT) to obtain detailed 3-D views of galaxies dating back as far as sixbillion years. The HubbleSpace Telescope can scope out the structure of faraway galaxies, while theEuropean Southern Observatory's VLT can use a spectrograph to reveal themotions of galactic gases. The combined 3-D view of ancient galaxies halfwayacross the known universe allows astronomers to trace mass and orbitsrelatively accurately. "This unique combination of Hubble and the VLTallows us to model distant galaxies almost as nicely as we can close ones,"said Francois Hammer, an astronomer with the Paris Observatory in Meudon,France. 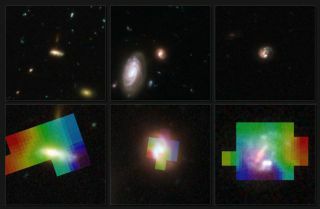 An international team has targeted about one hundredremote galaxies for 3-Dreconstruction, starting with results for three galaxies viewed by bothHubble and VLT's spectrograph, also known as FLAMES/GIRAFFE. One galaxy presented a mystery when FLAMES/GIRAFFEspotted its region of ionized gas, composed of atoms that have been stripped ofone or more electrons. However, Hubble failed to detect any stars after 11 daysof peering at the region. "Clearly this unusual galaxy has some hidden secrets,?said Mathieu Puech, another astronomer at the Paris Observatory. Computersimulations suggest that the super-heated region resulted from a collisionbetween two gas-rich spiral galaxies, making it too hot for stars to form. A second galaxy has become enshrouded in dust, with areddish disc surrounding a bluish central region. That could mark the firstexample of a disk rebuilt after a major galactic merger. "The models indicate that gas and stars could bespiraling inwards rapidly," Hammer noted. The third galaxy contained a very blue, elongatedstructure made up of young, huge stars. Such a result could have arisen from anunequalcollision between galaxies of different masses, according to simulations. "The next step will then be to compare this withcloser galaxies, and so, piece together a picture of the evolution of galaxiesover the past six to eight billion years, that is, over half the age of theUniverse,?Hammer said.